I know it’s a bit late for last years review but just wanted to share my experience. First thing first, i managed to lose a lot of pips last year. There were times when i was mentally drained and suffocated. There were minutes when i thought for a fraction of time, is forex trading for real ? Does people really make living out of it ? Is the whole forex thing just a hoax? I had all these confusions and doubts. But then when i reviewed my entire year of 2018, i realized as a new trader, it was not all that big loses. I gained ton of experience which will definitely help me to reach my goal of being a location-independent retail forex trader. So what did i learn last year ? How much have i changed in my quest to be a successful trader? I read a lot on the net. It seems most of the forex trader would blow one or two accounts on their journey to become a consistently profitable forex trader. However myself, i have never blown an account or came even close to it. My money management has always been good. I think it is not rocket science that if I’m not profiting with a small account, no way I’ll make money on the big account. From day 1, I never saw Forex trading as a gamble. It has always been a business, a skill set for me. So i was particularly stood away from “get rich quick” idea. I wanted to make sure i invest my hard earned money very wisely. As a day trader, i showed up on average 3 days a week during the New York session. My strategy does not require to backtest or pre analyze market during weekends. I trade 3/4 hours per day after work so a bit tiring at times. Since i work in Thailand, i have the luxury to trade NY session during night time. So i showed up, and lost most of the days and yet never crossed in my mind that i should change my strategy. Since i learned this day trading strategy from a reputed coach, so i never had doubt in my mind. As a result, it had allowed me to gain a lot of screen time experience. It is very important that i have that “gut” feelings about price action. I feel I’m taking right decisions these days. So i did not strategy-hop , sticked to my plan and learned valuable knowledge. A win for me. This is really big in my opinion. i have tracked and documented each of my trades. I have been trading since Jan 2016 and i have information of all my trades including screenshots. I use my ipad PRO with notability app to write down my journal while trading. Also take screenshots of my entries and keep those on Evernote app. My trades are well recorded on myfxbook which i’m yet to make it public. I can analyze my trade on my ipad PRO with the help of split screen option. one side i open notability and the other side evernote app. This way i can see my journal and screen shots of my entries. It is a perfect way for me to understand my mistakes. I can easily figure out the error that i have made while trading which helped me to hon my skill. I would paste the screenshot on notability and shall use my apple pen to draw lines to learn more about price action. i have years of records and charts.i would often read those at my free time to gain more experience. This process has been one of my key components to reach where i’m today. I shall write more about my journaling process in some day. Even though i lost almost every month last year, but not for a second i lost HOPE. I have always believed this will work. Yes i’m not the smartest bunch, it takes time for me to understand things and i know i have all the time in the world even at age 40 so i just kept on going. Every day i would give away pips and the next day i would trade again with new HOPE. However, as time progressed, i started to give way fewer pips. I knew exactly when i had to change my position size. 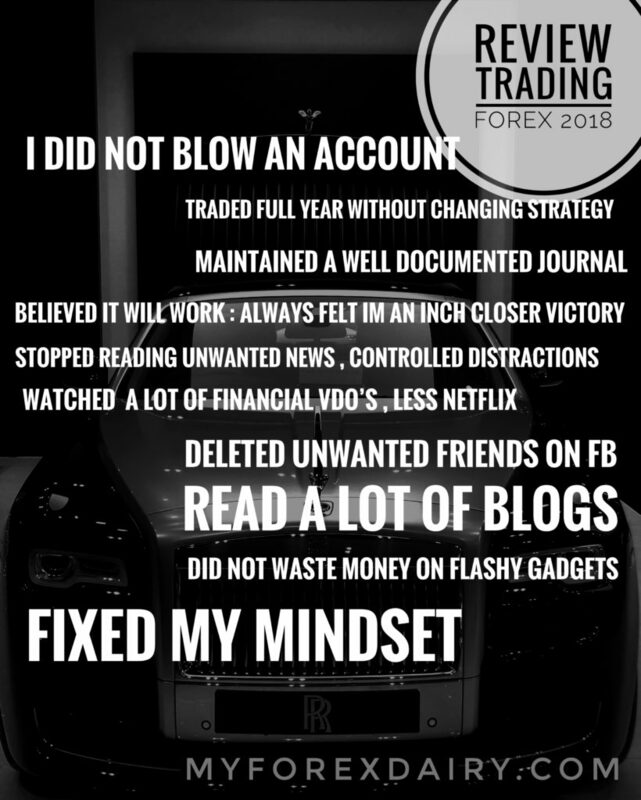 I noticed my mindset was improving and i was understanding when i should NOT be trading. I have taken all these changes and compounded my believe that YES, one day i’ll make consistent money on Forex. Even after three years of trading, i’m still as energetic as day 1. And in 2018, i have gained some serious experience which i think shall pay me in the foreseeable future. I was a news junky. I loved watching CNN, BBC etc. I would read ton of news which was not related to me at all. My father the same. He knows every political situation around the world. So i have unconsciously inherited his likings. Then one day i realized, what am i going to do with these information? it was overflowing my brain with nuisance. What Trump doing at the white house, why would i have to know that ? what am i going to do with the information about Melinia refusing to hold Trumps hand ? Or how many people Prince Salman of Saudi killed ? granted i feel terrible but i’m not an American neither i’m from Middle East. These news were not affecting my life so why would i have to know ? World is a horrible place so i figured i would be fine not knowing all these. I don’t need these distractions anymore. So i quit reading unwanted news. I hardly watch any news-channel nowadays. I can think more clear as my brain is no more filled with trash. Beside ton of cat vdo’s on youtube, there are plenty of educational documentaries too. There are vdos about financial freedom, ideas, lifestyle etc. just search by “entrepreneur” you should be able to find many clips related to our likings. Motivational vdo’s really sparks me. So it was big change in my approach how i would entertain myself. Instead of watching funny vdo’s, i switched to these type clips. Also i bought few courses on Udemy. there are many courses about blogging or Instagram or anything educational if interesting i would go for it. Netflix has been a big part of my life too. Once i start a series, there is no way i could stop it. I had to watch all the episode at once, which means an adrupt end to my weekend without achieving anything. So now, i do still watch but i would prefer movies like wallstreet, dirty money etc. But it is amazing how much less financial movies we have out there. so overall shift of mind this year for me. Deleted unwanted friends (?) on Facebook, socialized less in reality . I’m sure we all have those friends who has got nothing better to do in life except to share negative vibe on FB. They seems to have concern about everything happening around the world. They are really quick to share their opinion. Be it politics or religion or hate speech they are expert at everything. Some of them are my close friends with whom i have had my teenage life but since i’m now determined to success, i can no longer take trash. I simply deleted them. YES some said i shouldn’t use facebook anymore but hey it is a great tool to keep in touch with family. i just had to let go my toxic friends away. so now, my wall is fully clean, i only see good news. Instagram has been very interesting. I do have an account regarding my photography (@sunnysobhani) but i had no clue there are so many awesome guys in the financial world who are regularly using IG. There are ton of quotes, ideas, signal, advice just to name few. I get a lot of inspiration from Instagram these days. Blogs are good too. Just like this one. I use an app name FEEDLY to add all blogs together so that i can just browse through them instead of opening one by one. These blogs are great, helps me to stay motivated in the business. 3 years of trading is a quite long time, i need all the amenity to stay positive. I know one day, i’ll be super successful. This is also big on my list. Last year i bought the new iPhone and Apple Watch. Same year i also got IPad Pro 2017 model. It turned out to be one of the best investment as i could journal my trade way efficiently than i could have done with any other method. However in 2018, i was waiting for the new MacBook Air. Then when the product was launched, i thought to myself, do i really need a flashy gadget as i trade on windows laptop ? Since i already have the iPad Pro so it does not really make sense to have a 3rd computer in my arsenal. Other times, i probably would have gone for it however this time around, i could hold my purchase. I reminded myself i should become a consistently profitable trader first, then I should enjoy fancy gadgets. I should invest my time on trading , trading related books and learning new skills rather spending money on things i don’t need. I finally realized, my technic of trading is absolutely fine but the issue that i have been struggling was in my mind. I would not take trades even if it meets my criteria or punch out from my trade really quick without taking enough profit. Fear of losing money was creeping in me. Now i could somehow fixed that. I have a daily and weekly cap of how much i can lose. This method has significantly changed my mindset as i know this is the highest i can lose actually . And I have also figured out from my journal that , had i kept my trade on , overall i would have come out as a big winner. So in a nutshell , even though i had lost a lot of pips but i felt i have gained a lot of experience as well. It was not all that lose only . I feel I’m really nearing that lightbulb moment. I’m seriously working on it and soon , perhaps this year, i would announce myself a CONSISTENTLY PROFITABLE FOREX TRADER. Good luck this year guys.